The present joint action programme is proposed by the Organising Bureau of European School Student Unions (OBESSU), the European Students’ Union (ESU), and Education International (EI) to their members and partners, in order to advance the 2030 Agenda for Sustainable Development and its 17 related goals, which the United Nations adopted in September 2015. The 17 goals and 169 targets make up the most ambitious development agenda the World has ever seen. Composed much broader than the Millennium Development Goals (MDGs), they are addressing the eradication of poverty and inequality in all areas of social, economic and environmental development, and acts as guide to actions not only in the Global South, but in each of the World’s 193 countries. Education has been prominently included as Goal 4, which is to “Ensure inclusive and equitable quality education and promote lifelong learning opportunities for all“, as one of the transformative powers to create more sustainable societies. While the MDGs were centred around primary education, there is now explicit commitments to secondary and tertiary education. In order to realise the transformative power of education, stakeholders in the area of secondary and tertiary education must build on the 25 years of experiences and achievements of the Education for All-movement, which has shown that it is possible to advance the agenda of ensuring access to education through national and international partnerships. 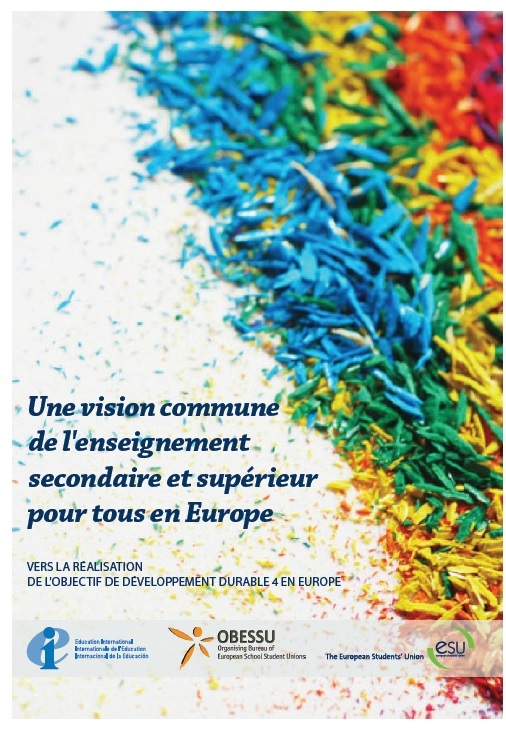 While recognizing early childhood and primary education as central to the right to education, this joint action programme represents the first steps towards creating a strong partnership for secondary and tertiary education in Europe. 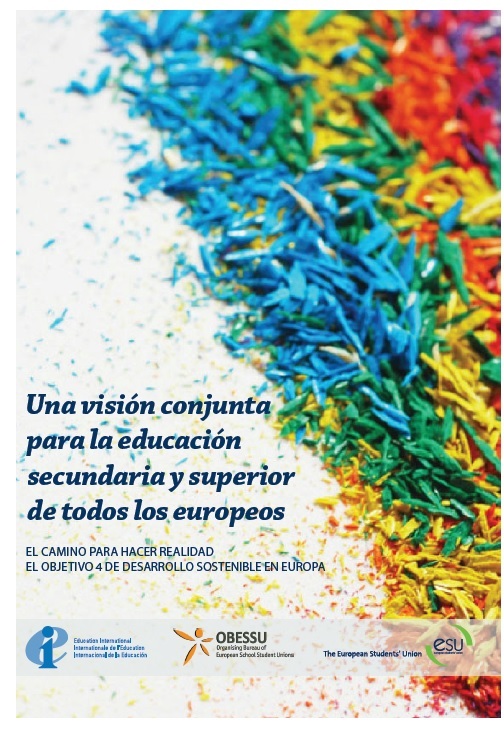 Equal access to quality education at all levels in Europe is yet to be achieved. European governments must take action to fully achieve the education goal by 2030. 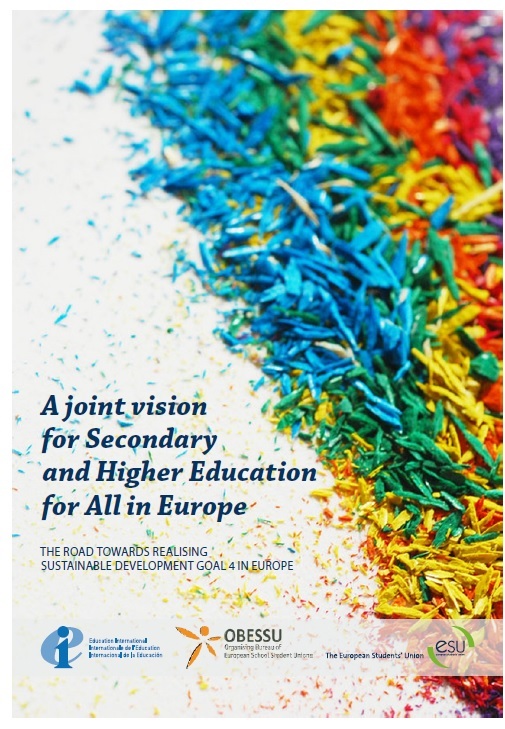 Therefore, with this joint action programme, our three organisations call upon members and partners, as well as policy makers and civil society, to join our vision and demands, to remind European governments about the commitments they have made, while seeking to contribute proactively to the realisation of equitable access to and completion of secondary and higher education in Europe by 2030. It is our hope that unions, civil society and policy makers at European and national level will take advantage of these visions and demands in implementing Goal 4, just as the action programme may be useful in other parts of the World too. To download the publication, available in English, French and Spanish, click on the images below.